So…if you haven’t heard yet, we’re throwing a freakin’ block party on South Ave. between Walnut and McDaniel this Saturday from 11am–11pm with 18 bands, DJ tent all day, food, and more! We’re also tying in a compilation CD featuring 16 of the acts performing (available for only $5 at festival!). Listen in now…and buy the compilation at the fest! Tonight brings two Springfield residents–one past, one present–back to the city for a big show. Future Leaders of the World, fronted by onetime Springfield resident Phil Taylor and the band responsible for this hit song, headlines The Outland Ballroom tonight with Formant, Assembly Line Gods and Glass Bottom Boat Ride. Also back in town is FLOW bassist and Formant guitarist Erik McGreevy, who will be doing double duty during the last two sets of the night. It’s a triumphant return for both men, each of whom has strong ties to the city and both of whom have worked hard to make the return of FLOW a success. So consider tonight’s show a celebration of sorts, and prepare to party accordingly. We’ll be there, along with the crew from Z 106.7 FM and Ozarks Live Productions, and we all like talking music over a beer. Find us and partake. CONTEST: Win tickets to tomorrow night’s Future Leaders of the World show! It’s an extremely busy week from concerts, and if you were at either or both of the Threat Signal/The Autumn Offering and Hurt/Sick Puppies shows you have exactly one night off until your next chance to rock out: tomorrow night’s Outland Ballroom show with Future Leaders of the World, Formant, Glass Bottom Boat Ride and Assembly Line Gods. The all-ages show is $12 at the door… except if you’re one of the lucky, alert people who wins a pair of tickets in our giveaway. Get details after the break and be ready! Catch FLOW on Rock Talk Sunday July 19 from 10-midnight as we debut 3 never before heard FLOW tracks plus a phoner interview with Phil Taylor. We’ll be giving away 2 sets of tickets on Thursday (day of show). Stay tuned for details. Some may remember Future Leaders of the World from their huge 2004 hit “Let Me Out.” They reached top 10 on Billboard and thanks to the disintegrating record industry, they faded away. Phil Taylor (he pretty much IS Future Leaders of the World) has gone on to do A LOT of great things including starting a new band based out of Benton, AR called Machina with former Evanescence guitarist John LeCompt and drummer Rocky Gray. Phil also started a production company (Phil Taylor Productions), with which he produced a number of Springfield, MO acts including Tara James, Cinemascope and The Horizon is After Us. 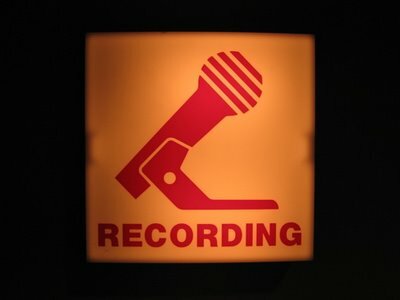 Phil and John also started RedRoom Studios. So, with a new band, production company, and recording studio going…he also started managing a few bands and booking for The Mustang Agency. Yeah, he’s a pretty busy guy. On top of all this, he’s also been working on new Future Leaders music and spent most of the past 6 months recording the new Future Leaders album, titled “Reveal,” at The Brewery Studios in Seattle, WA. Having gotten the chance to hear a number of the tracks from the upcoming album…this stuff is REALLY freakin’ good. 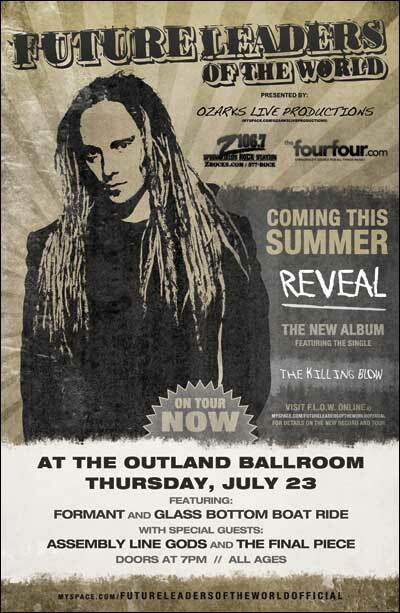 Lucky for us, FLOW is hitting Springfield in July…details after the jump. Warning: This video may not be suitable for some surfers. Some may deem it not safe for work, others may really like it. At any rate, you’ve been warned. Note: For highest quality viewing, click “HQ” button on the youtube toolbar. Ladies and Gentleman, thefourfour.com is proud to present the season finale of The FourFour Show with Kurtzender. Sit back, relax, and turn that noggin into mush with us. This Thursday hasn’t started out the best with FOG. FOG…srsly? Well screw it, there’s a ton of great stuff going on tonight to tease us of the weekend. Get out of the house and enjoy a good show or two with some friends. 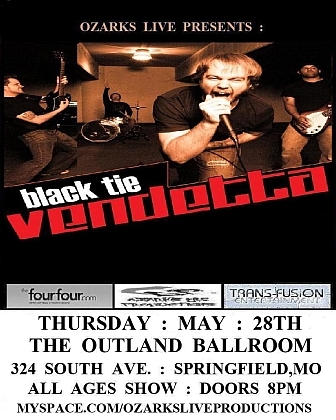 Our featured show tonight is a touring act out of Texas by the name of Black Tie Vendetta and brought to you by Ozarks Live Productions. These guys are like a more radio-friendly 36CrazyFists (which I am personally a big fan of) so this is going to be a lot of fun. Stop by their MySpace…we recommend checking out “Caught In A Crowd” or “Armed & Ready.” This show is ALL AGES and starts at 8pm. In support will be locals Formant, Assembly Line Gods and 7 Dollar Stereo out of Lebanon. At $10, you’ll get a great rock show worth blowing off “Must See TV” for a night. We got an unusual treat on this week’s edition of Z 106.7’s Rock Talk: We made Scott jump to the other side of the interview. Yup, our faithful co-host joined his band Formant to talk about new recordings and the battle of the bands May 9 to open for Korn on May 29. He switched from interviewee back to interviewer for a chat with local rock-jam group Cooter Brown and with Trevor Hougardy of Board Of Governors, the group previously known as The Beautiful Losers. Along the way, naturally, we rocked out to new tunes, both during the interviews and with Four From the FourFour, a selection of songs from local artists we think you should pay attention to in the weeks ahead. More music! More music, I say! It all gets started after the break. Turns out that after a nearly year-long break, former members of The Horizon is After Us have reformed with new members and new music to make the new band, FORMANT. More after the break.